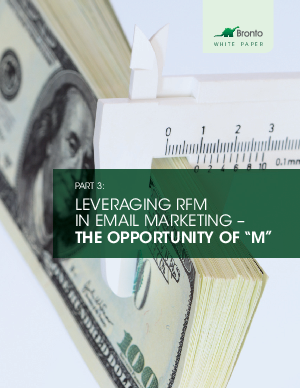 > Bronto > Leveraging RFM in Email Marketing - The Opportunity of "M"
The third and final piece in our RFM series highlights multiple email marketing strategies for analyzing a subscriber's Monetary value. As proven over many years with RFM analysis, marketers know that their highest spending customer segment is statistically more likely to spend again than their lower performing spending segments. Where the opportunity truly lies is in the fact that your most valuable customers will tend to become even more valuable over time.